I used to think that when it came to listening to music, what I and everybody else wanted was simple. We wanted everything, now and forever, wherever we are. And if we enjoyed the process, we’ll pay for it too (honestly, we will). But this isn’t strictly the case. Spotify Premium offers just this, but falters at one crucial point; it offers too much choice. Choice Paralysis is that feeling of being offered everything at once, and not knowing what to choose. When every piece of music ever recorded is offered on a plate, solving the problem of what to choose is a pleasure for myself and many others (if you’re spending the time to read a music blog, that probably includes you). But what about the other types of listeners, who don’t have friends dropping songs in their Spotify or email inbox, huge lists of playlists, an RSS/​Twitter Feed full of reviews from their trusted websites & blogs, and the firm belief that you can never listen to the second half of Bowie’s ‘Low’ too many times? They listen to what they already know, tire of it, and revert back to the trusted solution that has solved this problem for 50 years, the radio. Worse still, they’ll ignore music completely and head elsewhere for other forms of entertainment. Streaming music is now on the cusp of spilling into the mass market. But there are a whole host of rules and lessons that were learnt when selling to the early adopters that no longer apply. Controlling choice is one of them. It’s true that we’ve always had to choose what music we buy in record stores, the supermarket, or on download stores. But in these cases we were investing the finite resource of MONEY, meaning that we were informed about the music before parting with our hard earned cash, or we simply bought what we thought everyone else was buying. After this, there was then no choice but to invest time listening to the album to make our purchase worthwhile. Whilst listening, our options of what else to listen to had decreased substantially. When streaming music we are investing the infinite (well, almost) resource of TIME, not money, meaning the opportunity cost is far less, resulting in the listener constantly considering what better choices can be made. It’s this obsession with what better choice there may be that causes choice paralysis and, if that is overcome, decreases the enjoyment of listening to music. How is this being solved? 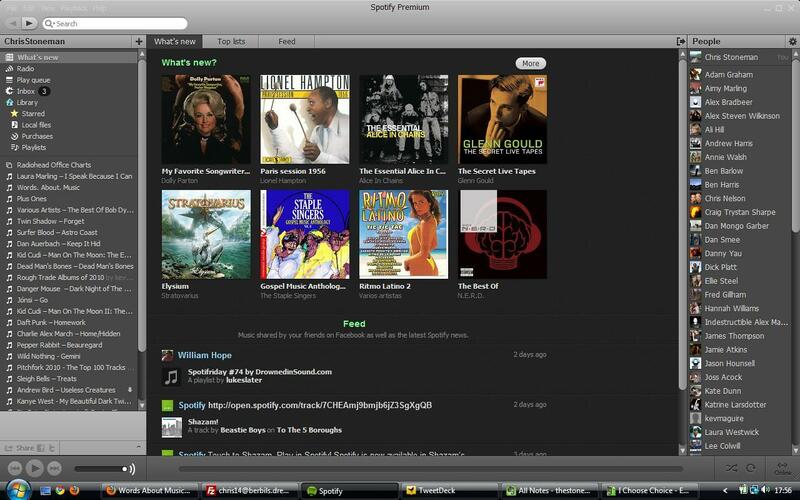 Here’s Spotify’s homepage, and their attempt at solving this. Yes, the social features (the feed and the people) are amazing but they won’t be there for many, more casual, users. We are presented with a variety of ‘new’ releases, with absolutely no context or indication of whether we’d like them. The radio feature is hidden in the top left, and even if we do find our way there we’re met with yet more choice of what decade and genre we’d like. We’re basically offered a blank canvas, possibly the most daunting prospect for someone who doesn’t really know what they want to listen to. Compare this to We7. Here we are immediately presented with a range of popular playlists and radio stations that are one click away from starting. Your eyes are drawn to the recently launched ‘Internet Radio Plus’, tempting you to push a station in the right direction by choosing your favoured artist. It may be similar to LastFm, but this is for the masses not the niche, and has a chance at sustaining a profitable business model. The on demand service still exists, but is there solely for those who know what they want. 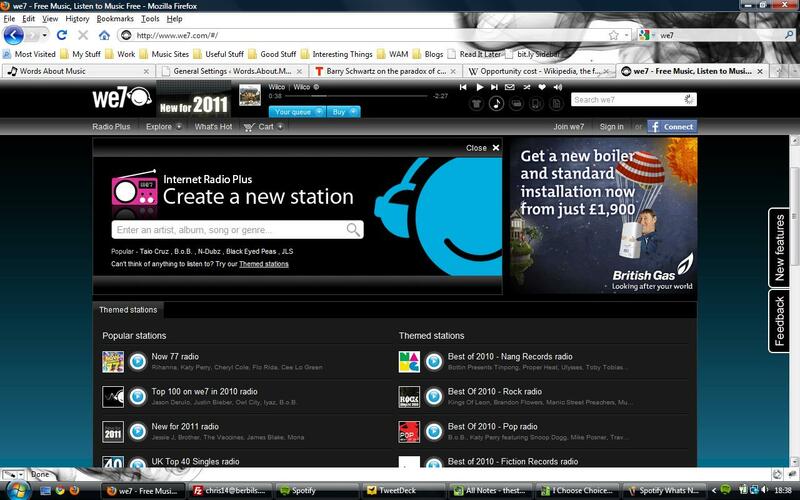 And then we have Pandora, the US only online radio station that has been such a success. There are no on demand features, just a simple homepage, but it is one of the only sites of this nature to register a profit in the last few years. There are also sites that are solely online radio, such as the wonderful Seeks Music who offer good music, sometimes some banter, and nothing more. This is what traditional radio is, but the internet has enabled Seeks Music to reach the niche markets that traditional radio can’t. Soon I’ll be able to listen to these shows from my phone, and hopefully one day through my home stereo system and car. It’s another way of limiting choice, filtering music, and giving me something to listen to, and it works. Each time you select a song to play, the service pays the rightsholder a higher fee than if that same song had been played as part of an online radio station. LastFm removing their on demand service and We7 focusing users towards their radio channels is a direct attempt to build a more sustainable business, and it’s working. Though Spotify is seen as the shining light of music streaming, there are still huge concerns regarding how they will tweak their business model to make it a profitable one. With a US launch apparently imminent, they’re under a lot of pressure to get it right. A music streaming service for the masses will awaken our love of music, and allow us to interact with it in a way not possible with radio as it currently is. We don’t want to buy CD’s anymore, that’s obvious, but we will pay for music to be delivered to us exactly as we want it. Streaming services will only become profitable when the mass markets adopt it. However, the on demand fees that will be owed to the rightsholders could financially cripple a business when millions of new users are suddenly introduced. Spotify should completely overhaul their radio options, and offer that alone as the Free version in the US. Every person who signs up gets a free 14 day trail on the Premium version WITHOUT being required to enter credit card details. The alternative (which will likely become the reality) is pandering to the risk averse, cannabalisation fearing US Major Labels and paying them extortionate fees up front, resulting in a business model doomed from the start. Early adopters have iPhones, but within a year the masses will have Android phones. If We7 can develop an app with an easily accessible radio section and the on demand capability included, bundled with a handset manufacturer in a deal similar to the MOG and Verizon deal, then there would be a real chance to steal Spotify’s thunder. So, what do we want? It’s true that we do want everything, now and forever, wherever we are. But crucially, most people don’t have the time, inclination, or knowledge to make a decision that meets their heightened expectations. Guide them through this complicated journey, and you’ll find a population willing to pay for the privilege of falling in love with music once again. Who Really Changed The Perceived Value Of Music : Labels or Filesharers? Thanks for talking about the “casual user/​listener”. I like how the music industry explores the new option of social media and the internet but they shouldn’t forget that not all of their potential fans are geeks. now I aam using net for articles, thanks tto web. to be a larger dragon.